Want to recognize your new Eagle Scout but are running short on time before the court of honor? A handful of U.S. agencies and service academies allow you to auto-generate a congratulatory letter or certificate you can print at home. The list includes the U.S. Navy’s Blue Angels, NASA and the National Park Service. Requests are handled on the honor system, which means you should not request a letter until all requirements for the Eagle Scout Award have been completed. If you have more time to spare or don’t mind getting letters or certificates after the court of honor, keep scrolling. I’ve also included agencies that ask for weeks or months to process requests. Pedro the Mailburro doesn’t just respond to readers in the pages of Boys’ Life. He also will personally recognize Scouts who have completed their requirements for an Eagle Scout award. The agency recognizes Eagle Scouts with downloadable certificates. NASA no longer produces paper copies of the certificates, and any requests received by NASA will not be processed. The agency, a BSA partner in promoting and protecting public lands, recognizes Eagle Scouts through a printable certificate of recognition. The OA, Scouting’s national honor society, offers printable letters of congratulations for new Eagle Scouts. There are two versions: one from the National Order of the Arrow Chief and Vice Chief (youth positions) and one from the OA chairman (adult position). The academy in Colorado Springs, Colo., will auto-generate a printable certificate for Eagle Scouts. The academy in New London, Conn., will auto-generate a congratulatory letter for Eagle Scouts. This federal agency within the Department of the Interior offers certificates you can fill and print at home. They are generic, meaning you could use them to recognize an Eagle Scout, Venturing Silver Award recipient, Sea Scout Quartermaster and more. West Point will email you a personalized certificate and letter. This congressionally chartered veterans organization recognizes Eagle Scouts with a “Good Citizenship” certificate. Thirty days’ notice is required. When possible, the league might even have a Marine present the certificate at the Eagle court of honor. The Air Force acknowledges Eagle Scouts through its Air Force Scout Recognition Program. Eagle Scouts can receive a certificate and letter of commendation. Scouts, Scout leaders or parents may submit a request at this link. The Air Force says to allow at least four weeks for the certificate to be printed and mailed. This is an automated, all-digital process. Paper requests (or “snail mail”) are no longer accepted. The Marine Corps, as of March 25, 2014, no longer honors mail-in requests. There is no process for online requests, either. The Marine Corps processes all requests at local recruiting stations. Call 1-800-MARINES (1-800-627-4637) to ask for the closest recruiting station near you. The U.S. Army’s Youth Certificate of Recognition program has been suspended. The academy in Annapolis, Md., no longer provides letters of congratulations to new Eagle Scouts. 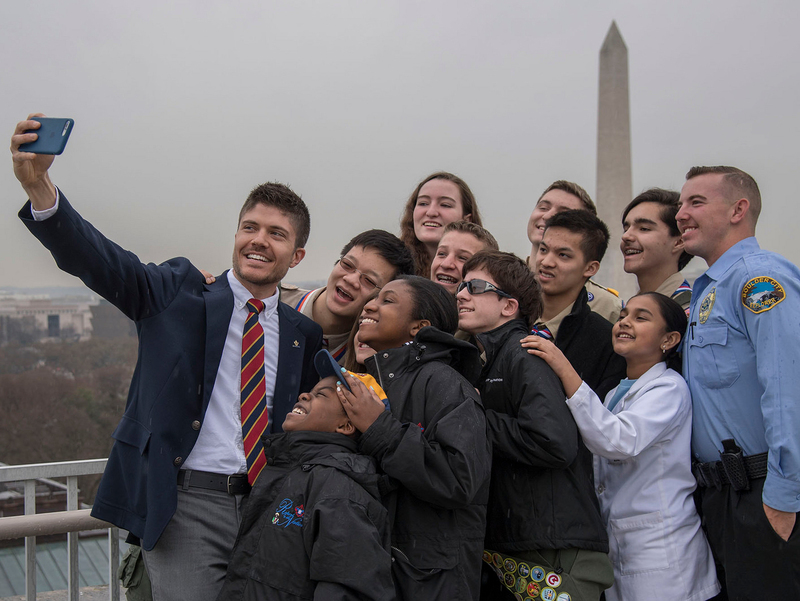 Scout groups can request a tour of the academy or attend the academy’s popular STEM Jamboree. Go local. Check with your mayor, local congressman or congresswoman, and local business owners. They might even show up at the court of honor! Check this frequently updated site, created by a BSA volunteer, which lists dozes of addresses for elected and appointed government officials. Aim high. Send a request to your Eagle Scout’s favorite athlete, musician, actor or YouTube star. It never hurts to ask!